This was a great and elegant dessert... but the down side is that it's not gluten free. I have yet to find gluten free phyllo dough or even a gluten free alternative, that is without having to make a homemade phyllo dough myself with GF flour. 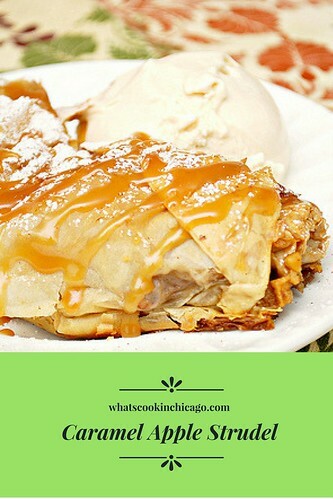 If you have suggestions for a GF phyllo dough substitute, I'd love to hear it! Otherwise, my non-gluten free friends will enjoy this. It's easy to assemble and bake... and it would make for a lovely food gift for the holidays to stand out from the common holiday cookie plate! Place bread in a food processor, and pulse 10 times or until coarse crumbs measure 1 1/4 cups. Melt 1 tablespoon butter in a large skillet over medium-high heat; add breadcrumbs. Cook 4 minutes or until lightly browned, stirring frequently. Combine breadcrumbs, apples, sugar, walnuts, and apple pie spice in a medium bowl; toss to combine. Lightly coat each of 4 phyllo sheets with cooking spray, placing one on top of the other. Spoon 3 cups apple mixture along 1 long edge of stacked phyllo, leaving a 2-inch border. Fold short edges of phyllo to cover 2 inches of apple mixture on each end. Starting at long edge with 2-inch border, roll up jellyroll fashion. (Do not roll tightly, or strudel may split.) Place strudel, seam side down, on a jellyroll pan coated with cooking spray. 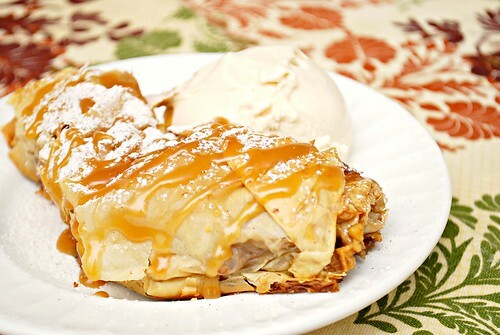 Repeat the procedure with remaining phyllo dough, cooking spray, and apple mixture. Melt 2 tablespoons butter, and brush over strudels. Bake at 375° 25 minutes or until golden. Cool on a wire rack 20 minutes before serving. 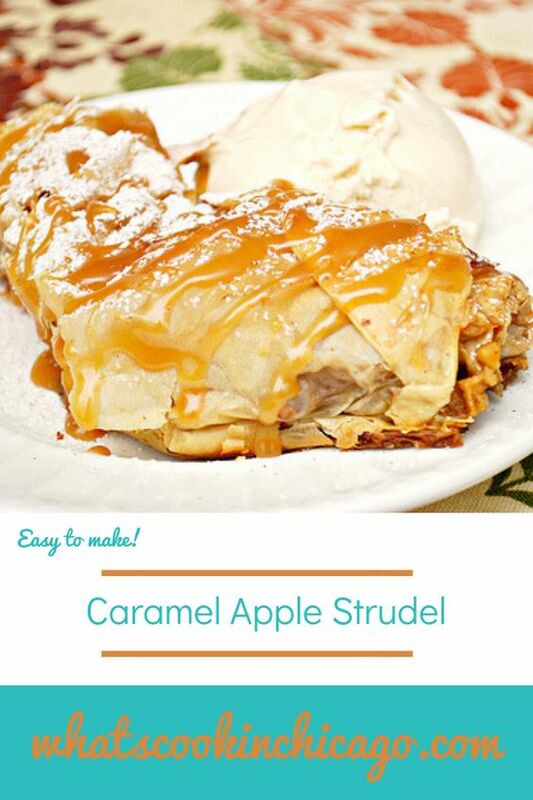 To serve, dust with powdered sugar, drizzle with caramel sauce and serve with vanilla ice cream. I both love and hate when my weekends are busy.